Macaws are miniture to large, often colourful New World parrots. Of the many different Psittacidae (true parrots) genera, six are classifed as macaws: Ara, Anodorhynchus, Cyanopsitta, Primolius, Orthopsittaca, and Diopsittaca. Previously, the members of the genus Primolius were placed in Propyrrhura, but the former is correct as per ICZN rules. Macaws are native to Mexico, Central America, South America, and formerly the Caribbean. Most species are associated with forest, especially rainforest, but others prefer woodland or savanna-like habitats. There is no unifying characteristic which differentiates macaws from all other types of parrots. All species have a long tail, but so do conures. The bare facial patch surrounding the eye and extending to the beak is unique to macaws, but it is reduced in some species, and limited to a yellow patch around the eyes and a second patch near the base of the beak in the members of the genus Anodorhynchus. Macaws are known for their impressive size. The largest parrot in length and wingspan, is the Hyacinth Macaw. The heaviest macaw is the Buffon's, although the heaviest parrot is the flightless Kakapo. While still relatively large parrots, the macaws of the genera Cyanopsitta, Orthopsittaca and Primolius are significantly smaller than the members of Anodorhynchus and Ara. 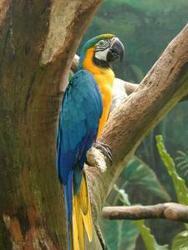 The smallest member of the family, the Red-shouldered Macaw, is no larger than some parakeets of the genus Aratinga. Macaws, like other parrots, as well as toucans and woodpeckers, are zygodactyl, having their first and fourth toe pointing backwards.